We’ve already seen Ugoos S85 board with Amlogic S805 processor for HDMI TV sticks some time ago, and now Android TV dongles based on the low power quad core Cortex A5 processor are finally up for sale, starting with M85 model coming with 1GB RAM, 8GB flash, HDMI and USB ports, and two Wi-Fi antennas. Connectivity – 802.11 b/g/n Wi-Fi with two external antennas, Bluetooth. The device runs Android 4.4. It’s not clear whether any cables or even a power supply are included. I’ve already tested two full sized TV boxes featuring Amlogic S805, and the main advantages of S805 over the more powerful S802 processor are its low cost and support for hardware H.265 / HEVC decoding. 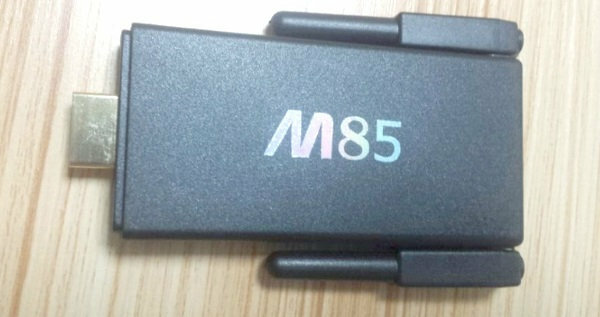 Unfortunately the former has completely gone out of the window, as M85 is currently selling for $98.99 on Aliexpress. For reference, MXQ S85 TV box sells for less than $50, so a market price for Amlogic S805 based TV sticks should probably be between $40 and $60 depending on components used.